Your Votes. Your Debates. Your Results. The Total Motorcycle Cool Wall. Unique, Original. Often imitated but never duplicated. Presenting the original and longest running motorcycle Cool Wall Guide on the Internet to what’s Cool and what is not. No matter what you ride or where you ride, this guide is for you. Check out what has been voted Awesome, Cool, Uncool and Fail by an independent community voting poll and make sure you are on the right side of Cool. Also don’t forget to check out the Motorcycle Cool Wall Awards presented every year by Total Motorcycle with prizes, trophies and TV time is given to the best (and worst) in each category… attended by millions of pistons and hundreds of tires, big and small! So vote and discuss today, don’t delay! Vote and make sure your ride isn’t a FAIL! 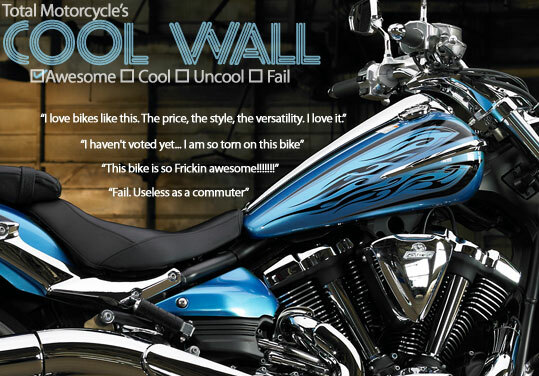 The Total Motorcycle Cool Wall, your Guide to Coolness. The final Total Motorcycle Cool Wall results are determined by public vote. Have YOUR say in the fate of a model on the Total Motorcycle Cool Wall: just VOTE and DEBATE in the discussion… Total Motorcycle’s Cool Wall Results. Your Guide to Motorcycle Coolness. Total Motorcycle Cool Wall Forum – We put the Cool into the Wall… no, we put the Cool into Motorcycle!